What's so important about the potentially powerful influence of conservative evangelical Christians on environmental issues, especially global warming? For years, many of these evangelicals have been charging environmentalists-and those progressive Christians who support environmentalism-with idolatry for lavishing worship on "God's creation" rather than God. Moreover, they have been skeptical, if not downright hostile, toward government-mandated protection of the environment. So as President Bush early in his administration initiated efforts to roll back a slew of federal environmental regulations-including safeguards on clean air and water and protections against commercial logging and drilling on public lands, among others-and withdrew American support for the Kyoto treaty on global warming, he knew he could count on conservative evangelicals to remain firmly in his corner. But changes are afoot. In February 2006, a group of 86 respected evangelical Christian leaders from across the nation unveiled a campaign for environmental reform and put out a statement calling on all Christians to push for federal legislation that would reduce carbon dioxide emissions in an effort to stem global warming. This Evangelical Climate Initiative, which has helped publicly solidify a nascent environmentalism in the evangelical community, also intends to lobby federal legislators, hold environmental meetings at churches and colleges, and run television and radio ads that link drought, starvation, and hurricanes to global warming. "The same love for God and neighbor that compels us to preach salvation through Jesus Christ, protect the unborn, preserve the family and the sanctity of marriage, and take the whole Gospel to a hurting world, also compels us to recognize that human-induced climate change is a serious Christian issue requiring action now," their statement read in part. But weeks before the Climate Initiative's statement was released publicly, another group of high-profile evangelicals was working to quash it. In a January 2006 letter to National Association of Evangelicals, whose affiliated churches and ministries were considering taking a stand against global warming, these leaders warned that "global warming is not a consensus issue, and our love for the Creator and respect for His creation does not require us to take a position." So how did conservative evangelicals, who tend to present a unified front on most matters of political significance, end up in such a public breach? And what effect might the growing commitment among evangelicals to combat global warming and other environmental perils have on the 2006 congressional races and the 2008 presidential election? Explore these conservative evangelical issues and learn how other faiths view their obligation to the planet-and let us hear your voice-in the MOYERS ON AMERICA Religion & the Environment Citizens Class. 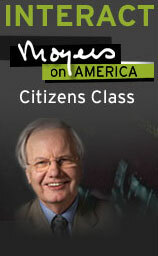 Join the Citizens Class discussion. Keep up to date on the world around you. Check out environmental news from GRIST! What do you believe is your responsibility, if any, to the environment? 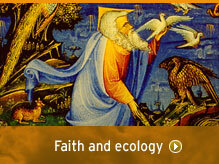 How does your faith or religion or spirituality affect your perspective of environmentalism or creation care? How does your faith or religion or spirituality affect the way you think about your role as a citizen?